My Childlike Awe for the Saints has Not Gone Away…. Seriously. I Promise. | The Size of a Mustard Seed. Matthew 17:20. My Childlike Awe for the Saints has Not Gone Away…. Seriously. I Promise. Okay. Yes, you have all the right to not believe the title of this blog post. But I promise I’m not lying. I have been anxiously waiting (and kicking myself) to get back to writing about our beautiful intercessors in heaven. Although, let’s be honest. I don’t really think there is a way to smoothly start blogging again and somehow hide these past few article-less months. So…. I’m just going to pretend like this whole awkward hiatus didn’t happen and jump right back into things. There is nothing like seeing someone come to life with what they are passionate for. We have all seen it. The moment we mention something and *spark* their heart is now on fire inside of them, causing their eyes to light up with excitement. From that point on, the struggle becomes moving on in the never ending conversation. But, you can’t blame them. Once you find something that lights the match inside of you – you have found something worth living for. People who had their heart on fire for God. They had set their heart on the eternal, instead of the temporal: on things not of this world. Their feet were grounded on truth – a foundation that is unshakable. For them, happiness rested on something that could never be taken away. They did not allow it to rest on things that would end; things that would vanish. And do not all of us desire this? Is that not what we are all looking for: That permanent fire of love? Well, it is out there. Better said, He is out there. That love, which is God, is waiting for us to turn around. With an outstretched hand He longs to come running towards us – to fulfill all of these desires. It’s okay if it takes us a little bit to do so. God will work with that. But He goes there, walking on the water in front of us, asking us to follow him. And once we are set ablaze with that love, their is no going back. We are fulfilled, all desires are met. We are then left to praise God…. Just as the saints did. 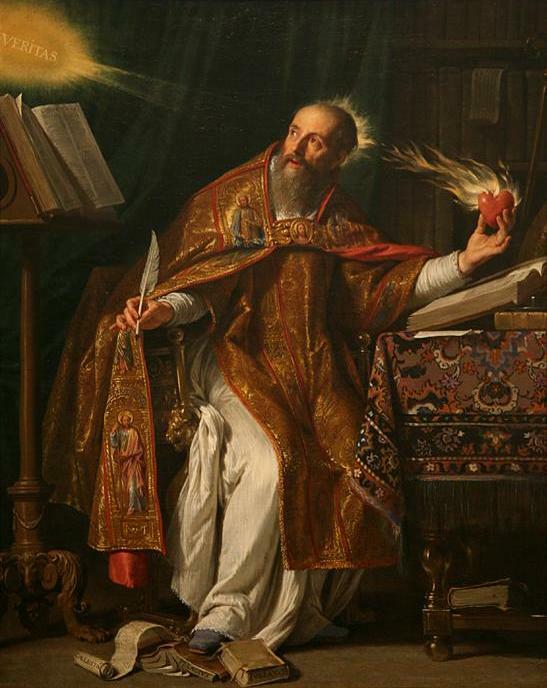 With this, I introduce to you St. Augustine of Hippo. He looked to fill of his desires with matters that would never satisfy. Money. Parties. Yep, the early life of this great saint included a great amount of these things. Although, quite obviously, by a great grace of God, that way of life did not last. This young man soon encountered a gift from God that would lead him to change the world. With this he threw himself to the ground and pleaded God saying: “How long more, O Lord? Why does not this hour put an end to my sins?” By a striking bolt of divine providence he heard the voice of a child say “take up and read!” Feeling in his heart that this was intended for him, he cracked open the Letters of St. Paul…. and that was all he needed. There, he found the message of conversion – a call leave his life of impurity and carry on in imitation of Christ. In just a matter of time, precious time when he was encounter this eternal relationship, he became a saint. His heart was lit and there was no going back. What started by an inspired look on the conversion of St. Paul led him to become a priest, then bishop, a famous Catholic writer, and a founder of a religious community. All due to that moment that he met our Lord’s divine mercy, love, and repented. This moment of grace and then the effect of total conversion is all captured in Augustine’s writings. Here, he goes through the way our Lord took his heart and penetrated it with truth. Augustine then does something amazing. He takes his “confessions” (the name of his conversion story) and takes them to paper. Through these writing he leads us to the same thing which St. Paul lead him to in his letters. God penetrating love and mercy: His greatness. So, let us aim to encountering this love more and more. To allowing it to bring us to a constant conversion, a daily changing and acknowledging of God’s will, and a drawing near to it. And we can never forget that God never stops wanting to forgive us and bring us to himself. That’s the awesome part. That if we need to “pull a Augustine” that will only cause a really joyful celebration in heaven.